This occasional chair and ottoman set can be the finishing touch on your living room, bedroom or anywhere in your home you need some extra seating and style. 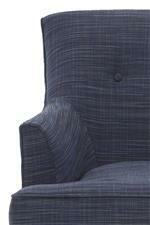 The chair features simple tufting on the seat back and flared arms on either side of the t-shaped seat cushion. Use the ottoman to prop your feet up and complete the look of the accent chair. The Elizabeth Traditional Chair and Ottoman Set by Klaussner at Furniture Barn in the Pennsville, Bear, Newark, Hockessin, Middletown, New Castle, Townsend, Talleyville, Wilmington, Marshallton, Smyrna, Elkton, area. Product availability may vary. Contact us for the most current availability on this product. K71800 OC Occasional Chair 1 33" 36" 33"
K71800 OTTO Ottoman 1 33" 25" 19"
Traditional in style this chair and ottoman set make a great accent piece for your home. Whether its updating your formal living room or a corner of your bedroom this chair can be a comfortable and stylish place to sit. The chair feature flared arms and simple tufting on the back. Both the chair and ottoman feature tapered wood legs for a clean look. The Elizabeth collection is a great option if you are looking for Traditional furniture in the Pennsville, Bear, Newark, Hockessin, Middletown, New Castle, Townsend, Talleyville, Wilmington, Marshallton, Smyrna, Elkton, area. Browse other items in the Elizabeth collection from Furniture Barn in the Pennsville, Bear, Newark, Hockessin, Middletown, New Castle, Townsend, Talleyville, Wilmington, Marshallton, Smyrna, Elkton, area.